In a pot with water, boil pork, tomatoes, onions, Gabi until the Pork and Gabi become tender. Add the Sinigang sa Sampalok mix, Labanos, Okra, String beans, Eggplant and Sili. Adjust the sourness by adding more mix or water. When Okra / Labanos are tender, add the Kangkong tops and simmer for a minute more or two. Serve hot or with Rice. 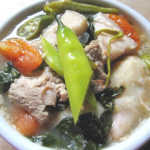 This video shows another recipe for Pork Sinigang with Gabi.